Performing a search engine optimization audit (SEO Audit) of your website is important for many reasons. First, you can identify problematic areas that need improvement and create an action plan to correct them and second, a good SEO audit will keep your website up-to-date with the latest developments in search marketing and on top of the competition. Before getting into the details on how to perform an SEO audit, it is necessary to understand the meaning of it and what to expect as the end result. An SEO audit is a process for evaluating the search engine friendliness of a website in a number of areas. While there are various tools you can use to SEO audit a website, the best approach is to either perform the audit by following a guide (like the one you are reading now) or hire an SEO Auditor to do the work for you. The SEO auditor will manually review the website and come up with recommendations of what needs to be fixed (because it is wrong) and what needs to change so that the performance of the website in search engines is improved. Why it’s important to SEO audit your website on a regular basis? Things change very quickly in the SEO industry and what is working today may not work in 6 months from now. Google reportedly makes thousands of updates to their ranking algorithm per year and an SEO audit, will help you stay in synch. It is necessary to perform regular SEO audits (at least 2 times per year) to ensure that your website is up-to-date with the latest developments. Now that you are convinced that an SEO audit is a must for every website, let’s see how you can perform your own audit. After reading almost all available articles on how to SEO audit a website and testing a number of audit tools, I came up with a list that covers everything you need to check. If you feel confident and what to skip the theory and recommendations, you can jump to the SEO Audit checklist directly. You can view the checklist online and download as a PDF. The first step is to check whether your website is penalized by Google. If your website is under a manual or algorithmic penalty, your rankings will be negatively affected. Note: If you don’t know the difference, between a manual and algorithmic penalty, read this. You should find out when the penalty was imposed, why your website was penalized and create an action plan to correct the issues and remove the penalty. There are two easy ways to check for Google penalties. Login to Google search console and then select ‘Manual Actions’ from the left menu. If there is a manual action imposed on your website, you can see the reason(s) here. The second way is to compare your Google organic traffic for the dates Google released an algorithmic change. A sudden drop (or increase) in organic traffic is a clear sign that your website was affected by the changes. Login to your Google analytics, go to ACQUISITION / ALL TRAFFIC and select SOURCE / MEDIUM from the left menu. Click Google / Organic from the right panel and set the dates to cover a long period of time. Compare the dates that you see big changes in traffic with the dates Google released an algorithmic change. What to do if you are under a penalty? If the above tests indicate that you are indeed into trouble, then the best approach is to find out as many details as possible about the Google updates and adjust your SEO audit accordingly. For example, if a site is penalized by Google because of thin content (very popular these days), then in the on-page SEO audit section, you should check the quality of your content and either improve, redirect or remove pages that don’t meet the quality standards. The second step is to search for your brand name in Google and review the results. Does your homepage come up first in the results? Does Google show sitelinks along with your listing? Is the description below your homepage and other pages accurate? Does Google show a knowledge graph entry (Google My Business Listing) on the right panel for your brand? Is the name and other information on your GMB page correct? Are the rest of the pages listed in the first page of Google results relevant to your brand? Scroll down to the bottom of the results and in particular the section “searches related to”. Are the ‘related searches’ relevant to your brand? What to do if you don’t get the expected results? If you don’t get a nice listing as explained above then this means that there are a number of issues with your website. The next step in the process is to do a thorough review of your website, starting with Technical SEO. Technical SEO comes first because you need to make sure that search engines can access and index your pages without any issues. Pro Tip: If you are not familiar with how search engines work, I suggest you take a moment and read my previous guide and watch the video. It will help you get a better idea of what we want to achieve with the SEO Audit. Don’t worry, although it is called technical, you don’t have to be a developer or system administrator to go through the steps. Here is your technical SEO checklist. If any of the tasks are difficult to understand, use the links provided to get more information. Is your website registered with Google search console and Bing webmaster tools? If not, then this is a top priority. Google search console is a free tool provided by Google which gives information to webmasters about their websites. Everything that Google knows about your website is available in the various tool options and reports. How many pages are submitted to Google and how many pages are actually indexed. For which keywords your website is ranking. Which keywords generated Google traffic. How to use Google Webmaster tools to improve SEO. Did you specify a preferred domain in Google Search Console? Google considers websites starting with www in front of the domain i.e. https://www.example.com and with no www in front of the domain i.e https://example.com as two different websites. To avoid any duplicate content issues, you should specify your preferred domain in both Google search console and website settings. Is your robots.txt file optimized? All websites have a robots.txt and it is used to control which pages should be accessible by search engine crawlers. A mistake in robots.txt can cause serious indexing issues, so robots.txt optimization should be high in your list. Do you have SEO Friendly URLS? Although nowadays most website development platforms and CMS have this correctly configured, it’s always a good practice to review your URL structure and make sure that you have SEO friendly urls. Good URLs include keywords (but they are not keyword stuffed), include hyphens (‘-‘) to separate the keywords, are unique for each page and are less than 255 characters (including the domain name). The breadcrumb menu is usually shown at the top of a page and it helps users navigate back to the homepage by following the menu links. Google always recommends having a breadcrumb menu as it makes a site navigation easier for users. Check and make sure that your breadcrumb menu is properly configured. Do you have structured data enabled? Structured data is a very trending topic these days and will continue to be for years to come. With the addition of structured data markup to a page you help Google understand the context and meaning of your content and this creates additional ranking benefits. Google uses structured data to enhance the presentation of a website in search results and for voice searches (think Google Assistant Questions). You can read here more information about structured data and what is supported by Google. 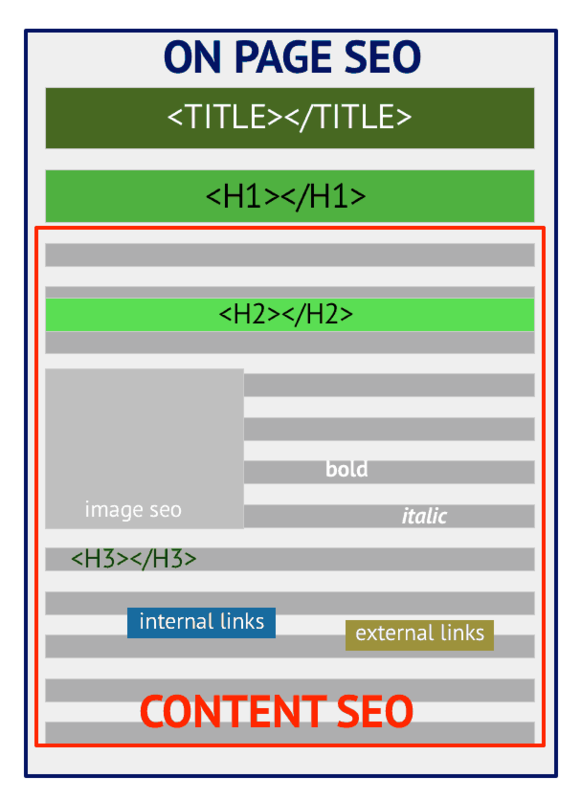 To add structured data on your website, read how to boost SEO with schema markup. Do you have a canonical URL set for all your pages? A canonical url helps Google identify the most important pages of a website and webmasters can use it to deal with duplicate content issues. Best SEO practices indicate that each and every page of your website should have a canonical URL. Read this guide from Google for more details. Is your 404 Page Optimized? A 404 page is the page shown to users when they reach a page that is not found on your website. A properly optimized 404 page is good for a smooth user experience and it’s very easy to optimize. Read section ‘The 404 page’ in my SEO Tutorial for more information. Is your XML Sitemap optimized? An XML sitemap is a list of all your website pages that Google needs to know about. The XML sitemap is generated by your CMS and it is submitted to Google via Google Search Console. The XML sitemap should not contain all your website pages but only the ones that are important for your website. Read my previous guide on XML Sitemap optimization. Https is a known ranking signal. This means that websites that have a secure certificate installed and their URLS start with https, have an advantage over non-secure websites. If your website is not https yet, this is a task to add to the top of your list. When you make your website https, make sure that you do it correctly so that your rankings will not be affected. From my experience talking to clients, handling web site page speed is one of the most difficult tasks at least for the non-technical users. Unfortunately, it is also one of the most important SEO factors and HAS to be addressed successfully. Study after study outlines the importance of page speed (especially for mobile) and how it can affect both your rankings and conversion rates. Your website should load fast and preferably faster than your competitors. Compress all your website images using tools like optimizilla or squoosh (by Google). These tools can dramatically reduce the size of an image without sacrificing quality. Use a caching plugin or page speed service to serve cached pages to users. Update to the latest version of PHP. Update your website and software to the latest versions. If the above list does not make much sense to you, you better hire a developer or SEO expert to do the work for you. It will not cost you a lot and it is something you have to do if you want to improve your rankings. With the increase use of mobile devices this sounds like an unnecessary question. You would expect that all websites are now mobile friendly but that’s not the case. There are websites not yet optimized for mobile and this translates to loss of traffic and rankings. With the introduction of the Google Mobile First Index, websites that are not optimized for mobiles are ‘excluded’ from mobile searches. Your starting point is to check your website with the Google Mobile friendly test tool and follow their recommendations. Accelerated Mobile Pages (AMP) is a new way of creating mobile pages. It’s a format created and supported by Google (and other companies). AMP pages load faster than normal HTML pages, but there are restrictions as to the functionality you can use. There is a long debate in the SEO industry as to whether you should adopt AMP on your website. My recommendation is to consider AMP if you are a ‘News’ publisher. If you have a corporate website, blog, or ecommerce store then going the AMP way will increase your costs without providing any additional advantages. Is your website available in more than one language? Websites that are available in more than one language should have the necessary SEO settings defined in the HTML code otherwise Google may consider translated content as duplicate content. For more details, read this guide from Google. Is your web site structure optimized? Regardless of the type of website, there are certain elements common to all, necessary for SEO purposes and a good user experience. Does the website have a clear content structure? Is the content grouped into relevant categories and pages? Are important pages linked to from the webpage? You can read detail explanations for all the above factors in my SEO Tips for beginners guide, which also includes real website examples. Once you are done with the technical SEO audit and fixed all issues, the next step is to deal with the content of your website. On-Page SEO is the most important part of the SEO Audit. In fact, many audits cover this part only but our approach, as explained above, is for checking other areas as well. The main goal of on-site SEO is to help search engines understand the meaning of your content. As a website owner, your job is to provide search engine crawlers with the right signals through the use of keywords and other on-page SEO elements. Are the titles and descriptions unique for each page and within the specified size? Can the user tell from the title what the page is all about and is the description an advertisement of what the page has to offer? Make sure that you don’t just have plain text in your pages. Any text should be properly formatted using H1 (for the main title) and H2 (for the main headings), bold and italics for the important parts, lists where necessary etc. The content of your website has to be unique. You can use copyscape to check all your pages for uniqueness and if you find duplicate content you have to remove or de-index these pages. Use Google Analytics to find the most popular pages (both landing pages and with the most visits) and make sure that these have high quality content (free of spelling and grammar errors, properly formatted, properly promoted in social media etc.). You also need to check content length and content freshness. If you have pages with little or no content or pages with similar content, you need to merge them together using 301 redirects. If you content is old or out-of-date, create a publishing plan and make sure that your website is updated on a frequent basis. You don’t have to post daily but you need to maintain a steady posting scheduling. 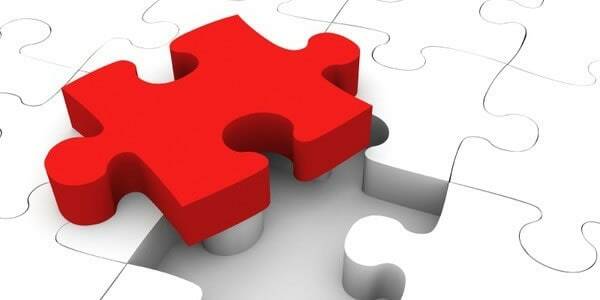 Linking your pages together is useful to both search engines and users. That you are not only using keyword anchor text for the internal links but you use both the full page title and non-keyword anchor text. The pages you want to rank better in search have the greater number of internal links. The pages you want to rank better in search are linked from your home page. You have between 2 – 10 internal links per page. Images are useful of making a web page easier to read and more attractive to social media (especially Pinterest and Instagram) but they can work against your SEO efforts if they increase the loading time of a page. Image filenames are descriptive to what the image is about. You can use keywords in the filename but do not overdo it. All images are compressed to minimize their size. If you are using a lot of images in your pages you may need to consider using a content delivery network (CDN). Broken links are bad for the user experience and thus not good from an SEO perspective. Use a tool like Xenu for checking all your external links. The tool is free and can give you a report of all broken links. You can then fix them by either removing them completely from your website or redirecting them to a valid URL. Use the ‘Crawl errors’ report in your Google Search Console to find broken links within your website. You can also fix them by correcting the links or doing 301 redirects to a valid URL. 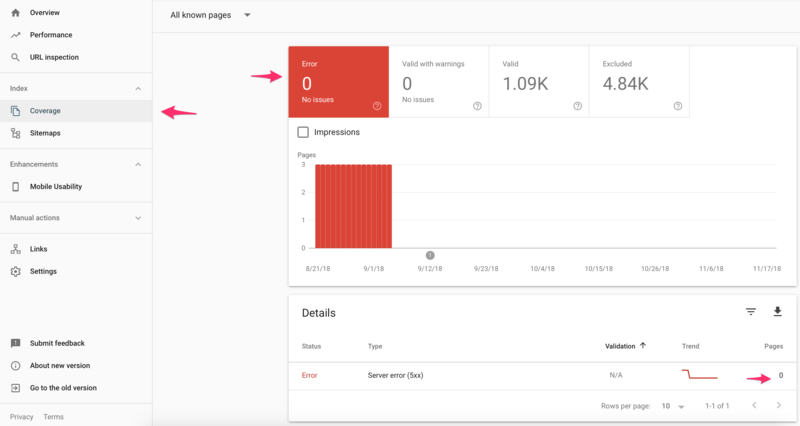 Crawl Errors Report – Google Search Console. A few years ago, Google started penalizing websites that have too many ads above the fold. While they are not specifying exactly what do they mean by ‘too many ads’ you can use this guide from AdSense to get an idea what is allowed and what is not (even if you are not using AdSense, the examples in the guide are still useful). If your ad implementation is not according to standards you have to remove or change the position of the ads. What happens when a user types a wrong URL? Is the 404-page friendly? Can the users find what they want is less than 3 clicks? Does it have a clearly defined main menu? Can you distinguish between Site content and ads? Does it have a consistent interface across all pages? Does it have a user sitemap? Off-Page SEO refers to methods and techniques you can use to promote your website on the Internet. It is usually referred to as link building. SEO Backlinks are considered by the Google algorithm as ‘votes of trust’ and websites with good quality backlinks tend to rank higher in Google results. Off-site SEO is important but if you are not careful of what you are doing and if you don’t know exactly what you are allowed to do and what not, it is also very risky. Although there are only 3 items in the checklist, you need to do a bit of analysis before having a clear picture about your off-site SEO current state. You can find out about your incoming links either by using a tool like SEMRUSH or by using the ‘Links to your site’ report from Google Search console. How many unique domains are linking to you? Which of these domains are considered trusted domains? How many links are pointing to your home page and how many links to your internal pages? Which of your pages have the most incoming links? What percentage of the links is keyword based? What is the ‘toxic score’ of each link? Depending on the answers, you may have to take some corrective actions so make sure that these are included in your action plan. For example, if only a few domains are linking to you, you need to get links from related domains so you need to create a list of possible websites to be used for guest blogging or blogger outreach campaigns. If you don’t have links from trusted domains you need to get in touch with the leaders in your niche and let them know that you exist (it’s easier said than done but if you get noticed by the big fish you have more chances surviving in the pot). If all the links are pointing to your homepage, you need to ensure that links are pointing to your internal pages as well. You can do this by either removing links from the home page or by building more links to the internal pages. If all the incoming links are keyword based (and Google did not penalize you yet) you need to urgently change them by making them more natural by using your domain name only, your full post title and things like ‘click here’,’ link’ etc. Unlike on-site SEO, off-site SEO is not a straightforward task and that’s why you need to know exactly what you are doing. Links are important if you want high rankings but you really don’t have to go out and build links like crazy. Instead, you should concentrate your efforts in building good websites (with good content) and links will flow in naturally. For all those who have made it to this point, congratulations! If something is not clear or there is a point you did not understand, let me know in the comments below and I would be more than happy to answer it. It’s difficult to survive online without having a decent social media presence; it is as simple as that. If you neglect social media and depend solely on search marketing then it’s like putting all your eggs in one basket and your risk is higher. To make a living online, you have to differentiate both your traffic and income sources and dependency on a single source (i.e. Google) is not the way to go. You may be wondering, how is social media related to an SEO audit? That’s a good question and there is a very simple answer. Social media affects your SEO efforts both directly (in the form of links) and indirectly (more exposure which may create more natural links and direct visits), so it is a factor that can influence your efforts to have a properly optimized web site. Basically, what you have to check in this section is whether you have a proper presence in the most important social media channels (Facebook, Twitter, LinkedIn, Instagram and Pinterest), whether it’s easy for people to find and follow you in those channels. 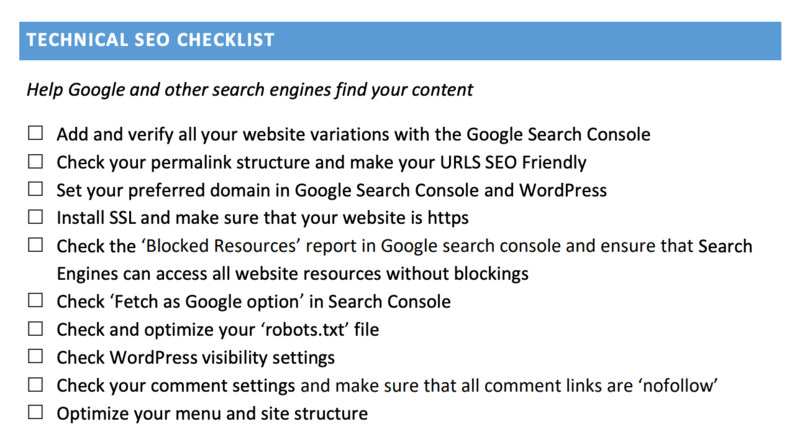 You can view the SEO Audit Checklist below or download as PDF. The PDF version is more comprehensive and it covers Local SEO and Mobile SEO as explained in our SEO Checklist guide. Configure Multilingual SEO (for websites available in more than one language). What to expect from a manual SEO Audit? From what you have read above, it’s easy to understand the value of a manual audit VS an automated audit performed by a tool. A tool is running an audit based on a number of predefined rules and does not have the experience and expertise of an SEO expert. Having an expert review your website has a number of added advantages. If you want to find out more, you can check our SEO Audit Service packages. The cost of a manual audit is reasonable and recommendations are specific to your website and are not generic like those produced using a tool. A description of the current state of your website – This is a detail analysis on how your website is performing in search, social media, number of internal/external links and any other information related to your website’s existing state. A list of actions based on a SEO audit checklist together with explanations for each and every item in the list. A report describing a complete Internet marketing strategy for taking advantage of all available sources of traffic and opportunities on the Internet and not just SEO. For all those who have made it to this point, congratulations! If you follow the recommendations above, it is almost certain that you will improve your rankings and organic traffic levels. If something is not clear or there is a point you did not understand, let me know in the comments below and I would be more than happy to answer it. Well done, thanks for this very USEFUL checklist! Now, i have a good base for SEO audit. Glad that you found the list useful. Good luck with your SEO Audit. I love it when someone takes the time to compile and organize information into a very useful resource like this. I am still in school for Internet marketing and just getting into this business. I will bookmark this for future reference. Thank you for your comment and welcome to the exciting World of Internet marketing! I have read your article and think it is amazing. I just wanted to point out a grammar mistake I picked up on. If you look at the following sentence I have put in brackets the mistake. I (game) up with a list of 60 items that covers everything you need to check. I hope you do not mind me pointing this out. Thank you for the great checklist. It is really useful and gave us a couple of new hints on optimization process. We’ve been using WebSite Auditor and found it exremely helpful in site’s structure and content analysis, bringing all the statistical information on the validation errors, social mentions, duplicate stuff, etc. under one roof. Still there is so many different SEO information you sometimes cannot understand what to start with. Fortunately you answered this question. Thank you again! Hi Alex, Glad to see someone actually ‘write specifics’ than make generic statements. well written. simplified. crisp compliation. awesome job. thanx. Great checklist Alex, thanks for putting this together mate. Alex, you saved my day and my career. Thank you so much. Should an audit be done for every single page or can the checklist be used to sum up all of the client’s pages? What if you have a client with over 500 pages to audit? Thanks Alex, much appreciated. I found my groove once I started on it. The first section is the tricky part, thereafter it becomes easier. It helped to create a bullet list of all the pages and then just copy and paste them into each cell to use as a reference for section I needed to check. Great Alex, that’s a nice checklist and saved me some time. Now following you on Twitter and G+. Thanks, glad I could help you with your SEO Audits. Thanks for this great consolidation of tips on SEO. I know for beginners this topic might be a little vague and obscure, but once you get the hang of a couple of useful tips you’re set. Relevant keywords along the page and on the meta section is pivotal, though I would also extend emphasis to the code as well as the content. For example, using text as headers instead of images (though if it greatly compromises your design, you shouldn’t) would help spider through your blog/website and figure the important knacks to pay attention to. So make sure to wrap headings, titles and subtitles in their appropriate tags. Just one extra quick tip. Great. This checklist can be handy checking tool; just before the schedule or publish button press. Thanks Alex, this is a clear and thorough post, very useful for designers like myself looking to promote client sites through means of SEO. I suppose not much has changed since you first wrote this post and principles are pretty much the same. Glad you liked it! Yes the post is up-to-date and valid so there are no risks at all. Thank you for sharing your audit list. I had been using one that I created but, you had few items that I felt were important and were missing on my list. I have pitched the typical Facebook and Twitter social media accounts to provide additional traffic but, what is the best way to convince a client about using RSS? Is it a good idea for them to try manage it or even implement it? Link building is a huge topic. 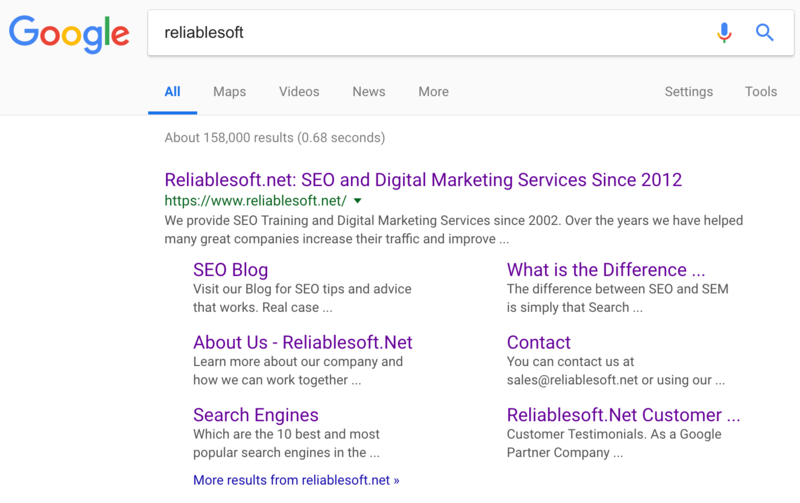 I suggest you start by reading this: https://www.reliablesoft.net/what-is-off-page-seo/, it has all the information and pointers you need. Need a complete overhaul of my site. Thanks for the tips. Good luck with your website. Give it some time, any SEO changes you do now may take a few moths to see the real effect in Google rankings. Thanks for this great consolidation of tips on SEO. Thanku for the checklists. Got a lot of new information. Thanks Alex, great detailed for someone who had very little understanding of this area until very recently. Thanks Alex, For someone new to SEO this is very useful. You have taken the initiative to explain things out so clearly. Thanks for your nice comments. All the best with your SEO efforts. Thanks for elaborating the things so briefly. It is so easy to understand. I really like the way you evaluate the checklist of on page SEO. Great Work. Thanks, good luck with your SEO Audits! For a newbie like me this post is so valuable. Thanks for the easy to read information and the meaningful additional links. I’ll be using this as a reference for a long time to come. Thanks for sharing great article SEO audits really interesting part of the SEO there is helpful to know the website errors and performance. SEO audit is a necessity today, when there is cut-throat competition in the online world. You never know when your opponent outranks you – which is the main reason why audit must be performed every few months. The checklist you’ve written covers all the major sections of audit. Thanks! That’s true, SEO Audits are important and should be performed regularly. Very useful content for the beginners and layman’s. The part of content and the checklist are very easy Understandable. I really need this article because I have knowledge ( little-bit ) about SEO but not step by step, like SEO audit report. Really a nice checklist! It has helped me a lot! Thanks for sharing this useful information Alex! Great checklist Alex – I keep looking for a simple and to the point reference I can give to people, but what I most often find is either too complicated for a beginner, or not actionable enough even for a pro. I tried to cover topics suitable for both beginners and more experienced users. Thank you for your comment. First of all amazing post! I did a chrome/lighthouse audit on my website and it shows problems in performance and progressive web app. Do you have any suggestion on how deal with these. Or any post which shows on how to get rid of chrome audit issues. This is a good resource for performing an SEO audit to a website. It’s great that you have added this checklist. This process is a must especially when starting a campaign, in this way we can see the opportunities for the site. Nothing more timely. Thank you for this.